"With Apologies..." is dark, depressing, cynical, and beautiful all at the same time. LaForge's poems remind me of a series of confusing dreams and nightmares that tend to stick with you all day long until the following night, when you hope the next dreams you have will erase the ones that came before it. I read "With Apologies..." twice, all the way through. Some of the poems, I read three or four times. I was inspired to read this collection over and over because I wanted to see if I could discover a multitude of new or different feelings I hadn't caught on to or noticed the first time I read them. My favorite poems in "With Apologies..." are "Doctor Appleman's Rest," "My Father's Teeth," and "School Field Trip." My own father's teeth seemed to be the topic of many conversations I had with my friends while growing up ("Hey Sarah, does your dad have wooden teeth? "), so that may have been why I was so partial to that particular poem. I also loved part 3 of "Hemingway's Rot." After reflecting on my choices, I realized that I enjoyed these poems the most because LaForge writes them with a blunt and clear voice, or at least in a voice I can relate to and understand more than I did her other poems. Many of LaForge's poems in the second half of the book entitled "All Women" hint of troubling and intense memories and experiences with her children, parents, and sister. Some of these poems are difficult to read, but only because of their intensity and darkness. 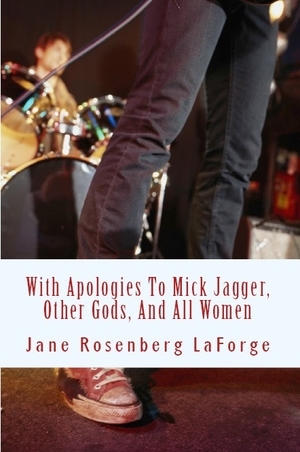 I'm pleased to say that I enjoyed With Apologies to Mick Jagger, Other Gods, and All Women so much that my copy has made a permanent home on my bookshelf. I definitely plan on re-reading this collection again in the future, which is a major rarity for me! In addition to With Apologies to Mick Jagger, Other Gods, and All Women, Jane Rosenberg LaForge has published After Voices and Half-Life. My all-time, favorite poetry books are the quirky Shel Silverstein's collections, seen below. Who are your favorite poets? What poetry collections have you read and loved? Share your thoughts with us in the comments section below.